We love running Lipcon & Lipcon, P.A. from the beautiful Miami area; but, with over 300 high-rises across downtown, we want to make sure you arrive to our offices safely and conveniently. Please follow the directions below- we look forward to meeting with you and discussing how we can help fight on behalf of your negligent accident or injury. Merge onto the I-195 W via the ramp to Miami/ I-95. After four miles, keep left to continue on the FL-112 W. Use the two left lanes to exit on Le Jeune Rd. South (The 112 and it’s exit is a toll road- there are longer routes that avoid the toll road). Once you pass Casino Miami, merge onto FL-952 S/NW 42nd Ave/ S Le Jeune Rd. Follow signs and merge onto FL-836 W. Shortly after you should pass by the Miami International Airport. Using the middle lane take exit 826/Palmetto Expy Rd, continuing on FL-826 S, following signs for Kendall. Continue onto FL-94 E/SW 88th St/N Kendall Dr. Turn right onto Dadeland Blvd to arrive at Lipcon & Lipcon, P.A. Head east on SW 184th St to turn onto the Florida Turnpike N ramp towards Orlando. Then merge onto the Ronald Reagan Turnpike. Keep left at the fork to continue on FL-874 N. You’ll be passing through Kendall now. Take the FL-878 E exit toward US-1; continue onto FL-878 E. Take US 1 S exit and turn right. 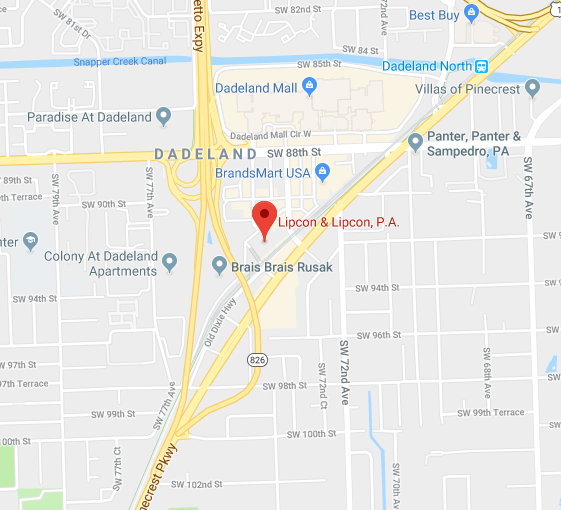 Turn right onto Dadeland Blvd and arrive at our law firm offices. If coming from Opa-locka, merge onto the FL-826 W from NW 167th St. Continue onto FL-826 S, following signs for Kendall. Use the right two lanes to merge onto FL-94 E/SW 88th St/N Kendall Dr. 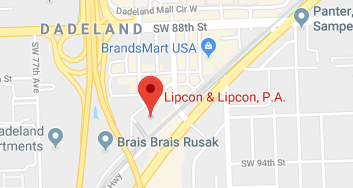 Turn right on Dadeland Blvd and arrive at Lipcon & Lipcon, P.A. We are also conveniently located ten minutes west of the University of Miami and have decades of experience handling campus accidents. If your child or a loved one was injured on the college campus, we can help and are easily accessible.